Am I Person of the Year or Not? The problem with smarty-pants headlines is that sometimes, just sometimes, they go awry. Generally calls for fancy footwork. Chrysler bought sponsorship of Time Magazine’s Person of the Year edition and a copywriter wrote a contextual ad: ‘You may not be the Person of the Year but at least you can drive like one’. Wait a minute! Time just told me I was Person of the Year. 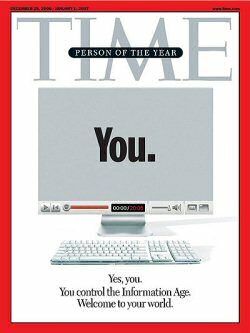 When Time chose “You”, a reference to the millions of people now contributing digital content, they inadvertantly made the sponsor’s headline contradictory. It’s a simple re-write of the headline: ‘Now that you are the Person of the Year, drive like one’. I can only guess that the agency and client are both on holiday. See, if they were big companies this wouldn’t happen. Here’s the ad in question.